Under the PACER Plus Project Readiness Package, the OCO organized National PACER Plus Rules of Origin (ROO) Workshop in Samoa and Tonga on 6-7 December and 10-11 December respectively. 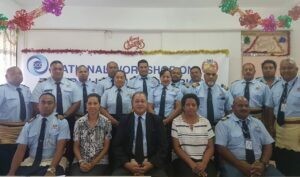 The workshops were facilitated by two pre-accredited PACER Plus ROO Trainers Samoa and Tonga Customs Officials. The objective of the workshop was to deepen the knowledge and enhance customs capacity on the implementation of PACER Plus ROO. The national workshops is also the final part of the pre-accredited trainer’s assessment for qualification as an “OCO PACER Plus ROO Trainers.” During the Workshop, the participants learnt about the features of both Preferential and Non-Preferential ROO, origin methodology, ROO criteria and verification procedures under Chapter 3 of PACER Plus and the practical application of the PACER Plus ROO. The Chief Executive Officer of Tonga Ministry of Revenue & Customs, Mr. Kelemete Vahe in his remarks at the Tonga Workshop “talked about the important role Customs Division plays in the implementation of the policies of Government as well as in the achievement of national development objectives. He further added that the Train the Trainers Modality adopted by OCO for PACER Plus ROO have enabled the development of a regional pool of skilled trainers to undertake training in their respective administrations and the Pacific region as a whole. He also emphasized the need to create ROO awareness to stakeholders to enable importers and exporters to benefit from opportunities provided by PACER Plus”. The participants at the Workshop provided positive feedback on the performance of the pre-accredited trainers and this would form part of the final assessment that will be provided to their respective Customs Administrations. This activity is part of the ongoing capacity building programs provided by OCO to enable PACER Plus signatories to implement their commitments under the Agreement.